Case studies of how fire retardant plantings helped protect property in recent fires in the Bridgetown / Balingup area in the southwest of WA. Follow up photos of what actually happened and digests of interviews with property owners and firefighters. 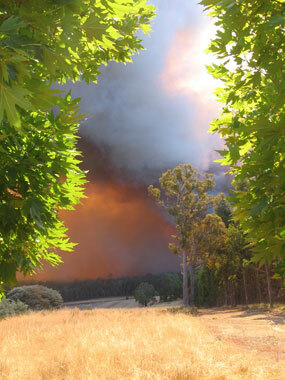 Information about which trees are fire retardant and which are accelerants, about how retardants and accelerants work, and some design and management "do's and don'ts" which could make a difference to the safety of live and property. "Take the Eucalypt out of the incendiary debate"